It’s not that I need an excuse to bake, especially if there’s a cake and/or chocolate involved, but the radio was so full of International Women’s Day blather today – George Hook was particularly enjoying himself with his list of “top ten females” on Newstalk! – that I just had to make something to distract myself. That, and the fact that Little Missy was grizzling about the kitchen because she refused to have her afternoon nap. Time to make a mini-woman’s day cake? At least baking, especially when she can view it from the perspective of my hip, keeps her entertained although we did get lots of screwed up faces after she stuck her fingers into a bowl of cocoa and straight into her mouth. I have to say that my technique for breaking eggs with one hand could do with a little practice but at least I didn’t get (much) shell into the batter. I came across this recipe via Shauna’s post on the brilliant Gluten-Free Girl blog and went straight the (gluten-full!) source at The Pioneer Woman Cooks. This is a good cake. And this is an easy cake, even if you decide to cook it in the late afternoon with a grumpy little girl in your arms who just likes to grab butter, taste cocoa and sip vanilla extract. Land the frosting on just as the Husband walks in the door and you’ve got yourself a guaranteed happy International Wo(Men)’s Day! You’ll find the original recipe with cup measurements plus great step-by-step photos over on The Pioneer Woman Cooks. This is my weighed out interpretation, with half the mixture of frosting. I also had to miss out on the nuts as LM wouldn’t cooperate with me chopping them up. Oh, and the photo? Turns out the recipe fills my swiss roll tin and there’s still enough to make a half-dozen cupcakes. Plenty for a really great cook’s treat. Preheat oven to 180°C (fanbake 170°C). Butter a 25cm x 38cm x 4cm swiss roll tin and put 6 bun cases into a cupcake tin. Put the plain flour, caster sugar and salt into a large bowl. Whisk well to combine. In a measuring jug, mix the buttermilk, eggs, bread soda and vanilla. Melt the butter then add the cocoa, stirring well. Pour over the boiling water, whisk and boil for 30 seconds. Remove from the heat. Pour over the dry ingredients and stir briskly to cool. Wait a minute, then pour in the egg mixture. Stir well, then divide the batter between the swiss roll tin and the bun cases. 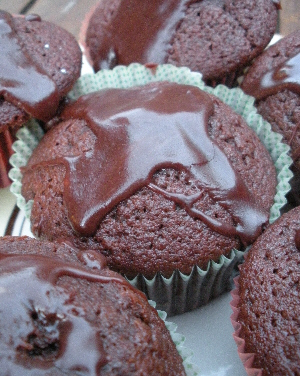 Cook in the preheated oven for 25-30 minutes – the cupcakes should be ready after approximately 20 minutes – until firm. While the cake cooks, make the icing. Melt the butter in a medium saucepan. Add the cocoa, stir well and remove from the heat. Add milk, vanilla and icing sugar, mix together and pour over the warm-from-the-oven cake. Cool and eat. Makes 20 large squares, 6 cupcakes and a lot of people very happy. Adapted from The Pioneer Woman Cooks. Sheet cake and cupcakes in one fell swoop – genius! Guaranteed to please both the colleagues and the fella. Will be trying this out very soon. I’ll bet! Anything that doesn’t involve creaming butter gets bumped to the top of my list, so much easier when working without a mixer. When I lived in NZ, I had a very basic kitchen – ie mainly picked up in charity shops – so the non-creaming recipes were at the top of my list too! I also have a Chocolate Brownie recipe which is lack-of-equipment-proof. Brownies are so handy! The recipe I use is very similar, but uses melted chocolate instead of cocoa powder (okay, it’s pretty much a heart attack in traybake form). The M&S book I got for Christmas has a ginger nut biscuit recipe involving melted butter, too – I’m intrigued. That ginger nut recipe sounds very interesting – let me know if you try it out!